You don’t have to be an aging Kremlinologist to read between the lines, you don’t have to be a member of the target audience to be alert for dog-whistles, you don’t need a decoder ring to catch what the Washington Post calls “a thinly veiled Trump comparison” in Michiko Kakutani‘s New York Times review of Volker Ullrich‘s new biography, Hitler: Ascent, 1889-1939. In his essay Persecution and the Art of Writing, Leo Strauss suggests that..
Persecution gives rise to a peculiar technique of writing and therewith to a peculiar type of literature, in which the truth about all crucial things is presented exclusively between the lines. Such a style may or may not be evident in Michiko Kakutani’s review, but if it is there it is skilfully done — and not, I’d guess, in fear of persecution. Here, the purpose is to avoid algorithms that hunt down racist and other hateful comments on social media and expunge them — so the code words used include google, skype, yahoo and bing. But wait. If you lob the h-word at Donald Trump, what ammunition will you have left for Rodrigo Duterte? 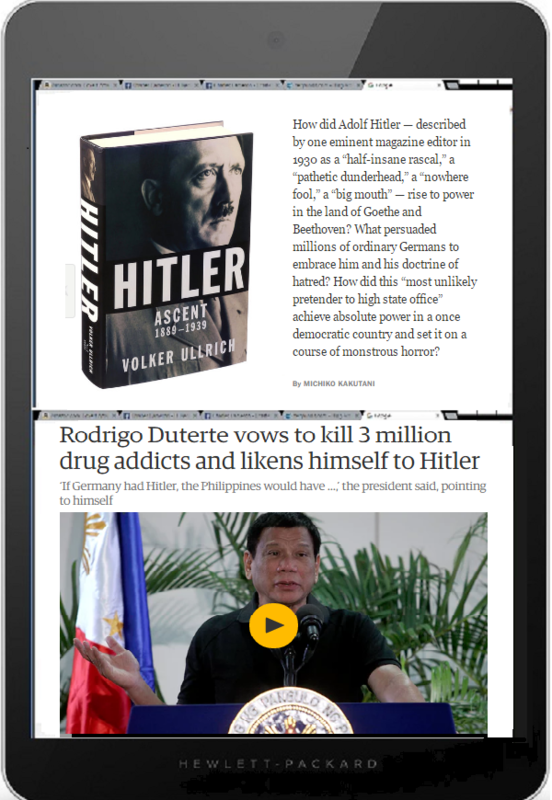 Duterte is quite open about his admiration for Hitler. If I had these speeches, and I am not saying that I do, I would never read them. Trump is no reader or history buff. Perhaps his possession of Hitler’s speeches merely indicates an interest in Hitler’s genius at propaganda. Mightn’t Kakutani simply be writing about Hitler and the new biography? 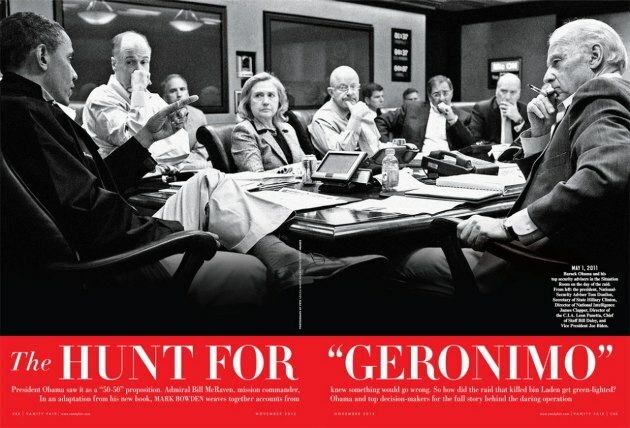 Oh, and if you insist on her having a second target, Trump may be nearer to hand, but Duterte is, well, more overt about his leanings..
Have you considered the Duterte possibility? — can be put is enormous. Here, to take your mind off contemporary politics and point it towards the higher levels of literary and religious thought, is Dominique Aubier’s comment on the Quixote, from Michael McGaha, Is There a Hidden Jewish Meaning in Don Quixote? if one accepts that Cervantes’ thought proceeds from a dynamic engagement with the concepts of the Zohar, themselves resulting from a dialectic dependence on Talmudic concepts, which in turn sprang from an active engagement with the text of Moses’s book, it is then on the totality of Hebrew thought — in all its uniqueness, its unity of spirit, its inner faithfulness to principles clarified by a slow and prodigious exegesis — that the attentive reader of Don Quixote must rely in order at last to be free to release Cervantes’ meaning from the profound signs in which it is encoded. You want to read the Quixote? How about spending a few decades in the Judaica section of your local university library first? But then, those were brutal times. Why do people cover their mouths? I mean, we had worked through a whole bunch of those scenarios. But, frankly, my belief was if we had captured him, that I would be in a pretty strong position, politically, here, to argue that displaying due process and rule of law would be our best weapon against al-Qaeda, in preventing him from appearing as a martyr. That — the quote itself, the Vanity Fair piece I grabbed it from, their upcoming full article by Mark Bowden, and or Bowden’s own book The Finish, plus any and all ramifications and queries relating thereto — strikes me as the sort of thing we might like to discuss here. Not that I personally have any competence in such matters. What I want to know, just out of idle curiosity, is this: why do so many of the people in the photo want to keep their thoughts to themselves? Posted in barack obama, bin laden, humor, psychology, recommended reading, Uncategorized, vanity fair | Comments Off on Why do people cover their mouths? Life imitates art, or vice versa? For a start, the photographer presumably saw the same thing with his eyes and through his lens that the cartoonist saw in the mind’s eye, and then on paper. Who knows, one of them may have seen the other’s work, and that could have been what triggered their interest in capturing the same effect. Then there’s the juxtaposition of the two images, and the fact of their close similarities and differences. Apart from the obvious difference of media, there’s the neat difference that the women in the photo reality might be thinking roughly the thoughts attributed to them in the cartoon, we’ll never know because thoughts are private — but the cartoon reality adds a “virtual” layer of text to the image, so the women’s “thoughts” and their parallelisms and oppositions are no longer tacit. But then — hey, those two sets of thought are juxtaposed, just as the two styles of clothing are — so each of the two images I’ve juxtaposed is itself a carefully-executed juxtaposition, artfully conceived, and revealing by comparing and contrasting. Each of those two images is a Sembl move. And we haven’t even begun to talk about the issue of burqas and veils — or bikinis and short short skirts — yet. 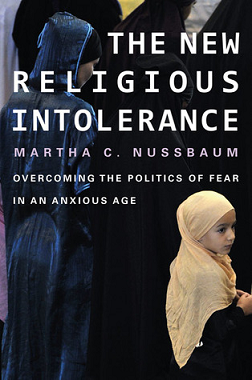 But this post is really my oblique way of introducing Martha Nussbaum‘s book, The New Religious Intolerance, which grew out of her column on veils and burqas — and tummy tucks and breast implants — Veiled threats, on the NY Times Opinionator blog. I’d love to review it. Will I ever even find time to read it? This business of religion and society is a subtle, multi-faceted business. My sympathies tend to go with whoever wants to wear whatever. But then I tell myself, I have different body parts, and they have different preferences. Perhaps more accurately — and certainly more metaphorically — I might say that I am part-angel, part-beast. Either way, I too contain multitudes. Received a courtesy review copy of WAR yesterday from the publisher, due entirely to the kind offices of Kanani. Read the first 50 pages this afternoon and found it it interesting because as a book, it exists on the opposite end of the spectrum from Mackinlay and Kilcullen. Where the former are giving a panoramic or telescopic view of COIN as strategic-operational-grand tactics, the author of WAR, journalist Sebastian Junger, is using a microscope to show COIN in the Korengal valley, Afghanistan as seen by an Army platoon, squad and individual soldier. Maybe an electron microscope would be a better analogy. Gritty. Will write a full review when I am finished. If any active duty or veteran readers were in Korengal or Afghanistan or have read WAR and care to sound off in the comment section, you are cordially encouraged to do so. Junger is also part of the documentary film project, RESTREPO, which he personally financed.